UncategorizedHow Do You Help Someone with a Drug Addiction? How do you help someone with a drug addiction? Find the answers here. It’s tough watching a friend or loved one spiral into addiction. You’re worried for their health, wellbeing, and safety, and the addiction can leave you with negative emotions like anger or resentment, especially if it’s adversely affecting you. But how do you help someone with a drug addiction? You can’t force someone to want to get better, but there are a number of things you can do to help them envision a future without the burden of addiction. Here’s how. How do you help someone with a drug addiction if you know absolutely nothing about addiction? You don’t. In order to help someone you love end an addiction to drugs, it’s imperative that you know a bit about addiction, including how it develops, how it progresses, how it’s treated, and how recovery is a continual process of becoming. Is not a choice, but rather a compulsion resulting from changes in brain structure and function. Is characterized by compulsive drug abuse despite negative consequences. Almost has underlying issues, such as chronic stress, a history of trauma, or a co-occurring mental illness. Almost always gets worse without help. Cannot be overcome with willpower or good intentions. Almost always requires professional help to overcome. Once you understand addiction, it will be easier to know how to talk to a drug addict about it. Talk to your friend or family member while she is sober. Tell her you’ve noticed she’s been doing a lot of drugs, and you’re worried, because you love her. Point out the ways in which you see the addiction negatively affecting her life–and yours, if it’s causing problems for you. Tell your friend you think she might be addicted, and tell her you want to help. Keep it light and casual. Don’t lecture or judge, and stay calm, even if your friend or loved one gets angry or defensive. If your friend agrees that she probably needs help, offer to help her find a treatment program. WhiteSands Treatment is a high-quality treatment center with a proven track record of success. If we can’t help, we can help you find a reputable, high quality program that can. If your friend is in denial or refuses to discuss the matter, let it go for now. You’ve planted a seed, and maybe it will take root. If not, you can try again another time. How do you help someone with a drug addiction if they’re in denial and you know that talking to him won’t be effective? Consider an intervention. An intervention is a meeting between you, your addicted loved one, and other concerned friends and family members. Together, you form a united front. Each concerned person explains to the loved one how you see his addiction is affecting him and how it’s affecting your own life. You lay out firm boundaries that will be put in place if he refuses to get help. These may be things like asking him to move out of the house or refusing to bail him out of jail or give him money. You’ve already chosen a treatment program that’s ready to admit him, and you let him know that he can either enter treatment now or suffer the consequences. Interventions that are poorly planned can go very wrong and make things much worse. But an intervention planned with the help of a professional addiction interventionist has a 90 percent success rate in getting the addicted loved one into treatment, according to the National Council of Alcoholism and Drug Dependence. The interventionist will help you choose a high-quality treatment program and help you understand how to talk to a drug addict about getting help. If your loved one doesn’t get help, follow through with the consequences. Only when she’s forced to face the consequences of her addiction can she come to the realization on her own that she needs help. 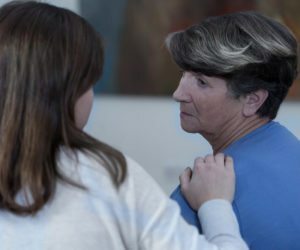 Even if she doesn’t get help, drug addiction help for family members can improve your chances of convincing her to seek treatment down the road. It can also help you better cope with the addiction. If your friend or loved one agrees to treatment, your support will be instrumental in her successful recovery. But how do you help someone with a drug addiction who’s new to recovery? The answer is to get support. Join a support group for friends and family members of addicted individuals to help you understand how to best help her succeed in her recovery. If you live with the addicted person, engaging in therapy can help you end your own dysfunctional patterns of thought and behavior resulting from living with addiction. Drug addiction help for family members is important and can help you better support your loved one.